I remember reading this issue and not really "getting" it. Now, the cover is one of the more "iconic" covers to me, of the Ultraverse line. Perhaps because I have a poster, and I’ve seen the issue so many times in quarter bins and such. 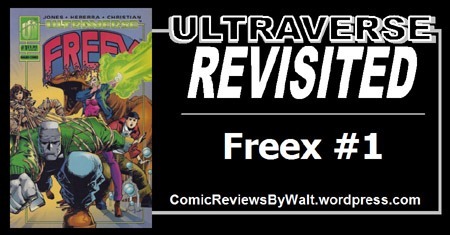 It also stands out to me–in memory–because of being one of the earliest Ultraverse titles (it premiered in the SECOND month of releases, part of the "second wave" of titles, along with MANTRA). It was almost always THERE, whether or not I was reading it (and mostly, I was not). But let’s look at this issue by itself, specifically, for now! We open on a kid being chased into an alley by police. He seems just as concerned about "something" happening as about the police themselves. They bump into a huge golem entity–very strong and impervious to their bullets. He calls the kid Huck, and is admonished for blurring reality and fiction…then calls him Lewis, and we learn that he is Ray. As they begin to escape, another kid unleashes her freakish powers, and Lewis no longer has a choice and unleashes his powers to protect the officers. Val seems to have a green energy burst, while Lewis can liquefy and reform himself. He escapes to a sewer while they others retreat back to their hideout, and the police are left to wonder just what the heck actually happened. Lewis reflects on how he discovered his freakishness, while at the hideout, Ray and Val bicker until a new arrival provides a new target for Val’s rage. The new girl seems to have a torso made up of or covered by sentient/controllable ropes or tentacles. We get a flashback of Val discovering her power in a detention center where a guard tried to force himself onto her. Outside the hideout, the new girl meets Lewis as he returns to the group. Inside, there’s further bickering, while Ray spray-paints something on a wall. 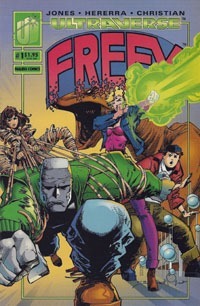 As we see that he’s tagged it for the group "Freex," another new arrival appears in a cobbled-together robotic body of pieces and parts in the hideout, and says he’s Michael, and wants to tell the group why he’s brought them together. The obvious comparison here for me is X-Men. Teenagers suddenly and inconveniently developing freakish (mutant) powers, being hunted and feared by normal people and authorities, banding together to survive, and apparently brought together by a player behind the scenes, who also seems to have powers which he presently can control. Of course, these are new characters, a new group, they’re "freaks" rather than mutants; they’re Ultrahumans, but lack the publicity and stature of The Squad, Hardcase, Prime, and where most of the Strangers are adults, these are kids. As first issues go, we’re introduced to an ensemble cast with a couple of pages each for several characters in flashback, showing where they were compared to where they are now; we’re introduced to a newer character with a bit less history than the first three kids seem to have; we see the situation they’re in, struggling just to have food and shelter to survive while dealing with powers that make them vastly different from anyone else. We get a reason for their "team name," and learn that they didn’t "just" bump into each other and band together, but they’ve been consciously, specifically BROUGHT together. 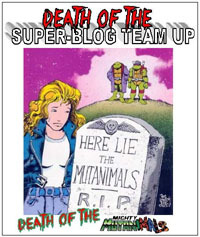 It lets us see the starring characters, who are featured on the cover, we see them together, and get a number of little details…none of the more modern early-2000s-to-present "hide the hero" or five issues of solo characters finally meet in a sixth issue and show a hint of being a team, when it’s a team book. There’s a bit of mystery–who is Michael? Why has he brought them together? What’s his motivation? Will they accept it or turn on him? But that’s the "hook" to get one to come back for the next issue. Visually, this is a colorful yet dark book. The characters are individually recognizable, if not entirely consistently rendered, and one can pretty easily follow along what’s going on. One bit that stood out to me, though, is when a police officer is thrown at a wall: we get a scratchy panel of him hitting a wall, seeming to indicate how hard he hit–like Ray’s killed or crippled him. Yet in dialogue later on, an officer refers to "silly putty walls," and there doesn’t to seem to be any concern regarding any dead/crippled officers. So whether that’s on me for the way I "read" the visuals or not, I lay partial blame at the lack of any "visual sound effects" to the panel (really, the entire issue!). All in all, though, this is a good first issue, and far better than I remember from any previous read-throughs. Though this got a CD-Romix Comix release over Strangers, and I’m very familiar with the Hardcase and Prime ones, I never really cared for this one. I’d put off reading this issue, not really looking forward to the (re)read, but wound up enjoying it a lot more than I’d expected. I’m actually interested in the next issue, and learning more of the ACTUAL details of this group of characters than just seeing covers from later in the run and such. This is another first issue that’s definitely worth getting (and reading!) if you find it in a bargain bin. And let’s face it…the early Ultraverse #1s are quite plentiful. It’s the later issues of the series that you’ll be hard-pressed to find.